Midway Stadium is the name of two different minor league baseball parks in Saint Paul, Minnesota, one now demolished and the other still in active use. 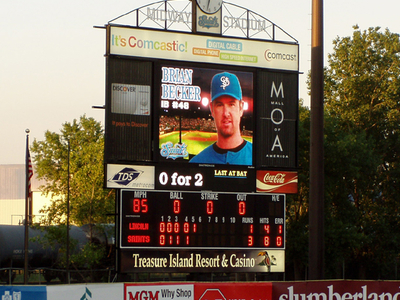 The name derives from the location of the stadium in St. Paul's Midway area, so named because it's roughly halfway between the downtowns of Minneapolis and Saint Paul.The first Midway Stadium was the home of the St. Paul Saints of the American Association from 1957-1960. It was built with just a small uncovered and presumably expandable grandstand. It was intended to compete with Metropolitan Stadium for attracting a major league baseball team, but the already-larger capacity of "The Met" doomed Midway Stadium. It was abandoned for professional baseball once the Twins arrived in 1961 and displaced both the Saints and the Minneapolis Millers. It was used for minor events and as a Minnesota Vikings practice field for the next 20 years, and finally demolished in 1981 to make way for the Energy Park. That development, with all new streets and various buildings, rubbed out any trace of the ballpark's existence. Here's the our members favorite photos of "Stadiums in Saint Paul". Upload your photo of Midway Stadium!